From left: John Payton, Judge Harry Edwards, Capt. Buddy Vanderhoop, Charles Ogletree and Henry Louis Gates Jr. I'm sitting at my computer, with tears falling from my eyes, writing this letter to you. These are tears of pain in losing you because you were like a big brother to me. They are also tears of joy, celebrating and remembering the nearly 37 years I've known you since we met at Harvard Law School in the fall of 1975. Although I have often thanked you for your friendship and guidance throughout my adult life, I'm not sure you realized how much your friendship has meant to me. I want to try to express it now as I reflect on the good and bad times, the ups and downs, and your constant support of me, no matter what challenges life brought my way. As I write this letter, I'm reminded that your passing away on Thursday was the end of our time together over these many years and the culmination of the difficulties life has offered these past six months. You know the pain I felt when our dear friend Derrick Bell passed away last October. He was not only my teacher, but my inspiration in understanding and pursuing a career in law and social justice. You know how difficult it was to lose another dear friend and mentor, former D.C. Superior Court Chief Judge Eugene Hamilton, when he passed away last November. I tried cases before him as a young public defender, and watched him, over more than 30 years, come to Harvard Law School and patiently teach thousands of students legal ethics and strategies in trial advocacy. I was overwhelmed with sorrow earlier this year when my mentor and friend, federal district court Judge Robert Carter, passed away in January. Just a week ago, a dear friend of more than 30 years, Chuck Rouselle, passed away, and I wept as I remembered our wonderful and joyous years at the District of Columbia Public Defender Service, and our friendship since then at so many social and political events. I cherish the friendship and mourned the loss of all of these great African-American men. And then I lose you. Sixty-five years young. Full of energy. Always ready for the battle and always willing to lead the fight for equal justice under the law. I remember how you warmly greeted me in 1975. I remember when we were co-counsel on a case in a criminal law clinic at Harvard. I remember our representation of a client charged with multiple counts of burglary, and our conversations with him before a court appearance. I remember our sense of good fortune when the complainant did not appear in the prosecutor's office that morning, and the assistant district attorney had to move to dismiss the case. You shared with me that this "criminal law stuff" was not your calling and that you would pursue a career in civil rights. When we both left Harvard, you and I went to D.C. to work for different institutions. You joined the Wilmer Hale firm, and I the D.C. Public Defender's office. Every time I had a matter that needed urgent help, I turned to you and you never said no. When I wondered whether I could leave the Public Defender's office and teach at Harvard Law School, you said, "Yes!" You were a true friend. You supported and encouraged me even when I doubted myself. In every step in my career, you were the big brother, guiding me in my work, and making sure I stayed focused on my goals. When Randall Robinson, Rev. Walter Fauntroy, Dr. Mary Frances Berry and others got arrested at a protest against South Africa, you quickly joined the team of lawyers with me and helped to represent thousands who were similarly arrested. Your stoic focus on the clients before us, and the goal of ending apartheid in South Africa, was a constant reminder of not only your great lawyering skills, but also your commitment to the larger sense of justice guiding our work. While you focused on the law and Constitution like a laser beam, you also took the time to make sure that those of us around you not only understood our part, but also developed skills that we could pass on to others as well. I remember your unyielding commitment to justice and equality as a young lawyer. Your inspiring work on the 1982 NAACP v. Claiborne Hardware Co. case supported the NAACP's constitutional right to boycott businesses run by white merchants. I saw your passionate argument in the Richmond v. Croson case about affirmative action. The United States Supreme Court ruled against you, but you did not give up the fight. The most remarkable work I ever saw in a case, from start to finish, was your extraordinary work in the Gratz and Grutter cases. Most people will remember your name on the briefs and your outstanding argument before the U.S. Supreme Court in 2003. I remember so much more that says a lot about you as a lawyer. You were incredibly passionate with your clients, organized a large group of experts on diversity, pressed civil rights groups to understand how these were perhaps the most important cases since Brown v. Board of Education, litigated the cases in the District court and the 6th Circuit Court of appeals and won, and ultimately successfully argued the cases before the Supreme Court. I should have told you then, after praising you and your efforts, what I tell you now. Your performance reminded me of the efforts of the late Charles Hamilton Houston. As you know, Houston, an African-American lawyer, was born in 1895 in D.C., attended Amherst in the early 1900s and was the first African-American editor on the Harvard Law Review. He then taught at Howard Law School, training remarkably gifted law students such as Thurgood Marshall and Oliver Hill, and set the legal stage to challenge Jim Crow segregation in the United States. His cases were always well-prepared, and his clients and junior lawyers were always learning as he taught them the inner workings of the legal system. Charles Houston died much too soon, at the age of 54 in 1950, but as his former student, Thurgood Marshall, then attorney and subsequently Supreme Court justice noted, Brown v. Board of Education would not have been decided favorably in 1954 if Charles Hamilton Houston had not prepared the young lawyers in the 1930s to 1950 to press on in his absence. They did, and we have achieved so much because of Houston's leadership. Like Houston, you were always teaching those around you, and making sure that we saw, in the distance, the bigger picture, and were prepared to pay the cost, through hard work, to achieve the victory. Like Houston, you have left behind a powerful legacy and made an indelible mark on the legal system. Those of us who follow your lead will carry on the struggle for racial justice and equality using the road map that you have drafted for us. There is no other way to proceed. I remember when Ted Shaw resigned in 2008 from the NAACP Legal Defense Fund after many years of impressive work, and during the search for a new president and director-counsel, our law school classmate Ted Wells wondered whether we, at our comfortable jobs at Wilmer Hale and Harvard Law School, respectively, would throw our hats in the ring. Although you were a prominent partner and involved in many national and international matters through the law firm and your work with your wife Gay McDougall, with Gay's support you agreed to be considered. Not to leave me off the hook, you urged me to join the LDF's board of directors, which I did. I can't recall a week that we have not talked about law and politics, the Supreme Court or our local schools, or encouraging more young people to consider careers in law and public service. While the law occupied much of our time over the past 37 years, we also found time to simply enjoy each other's company. We were not always focused on civil rights and racial justice. We had both fun times and sobering dialogues. 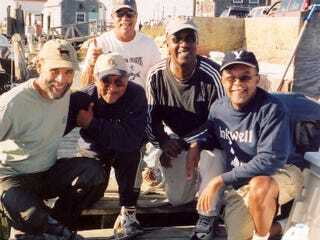 I remember our annual fishing trips each August, when we were joined by former D.C. Circuit Chief Judge Harry Edwards, The Root's editor-in-chief professor Henry Louis Gates Jr. and occasionally professor David Wilkins or my college classmate Ken Bacon. I have never seen more trash-talking among grown men, nor the immediate bragging rights for catching the biggest striped bass, or laughing at the person who caught no or very few fish. We would talk about anything and everything, with the dialogue starting and ending on the boat. We had even scheduled our 2012 summer charter fishing trip with Captain Buddy Vanderhoop, anxiously planning for good times on Martha's Vineyard. We would always stop by Vernon Jordan's house for wonderful food and drinks before heading to our respective venues. Every occasion was precious. I remember well the blunt and insightful advice about politics and the legal system. You invited me to your Vineyard home in 2008, and I was grilled by about a dozen close friends about this guy named Obama and why I was so committed to him. It was a sobering conversation, and though at times it felt painful, it was out of love and respect. I recall when you and Gay invited me and my wife Pam to your home following the inauguration of President Obama in 2009, and we celebrated his election with a champagne toast. I recall this past summer when you and Gay came to my house on the Vineyard, and you had a frank and candid discussion with the president, always being direct and insightful. I know that we all hoped to continue that dialogue this year. I promise you that I will continue the dialogue, privately and publicly, on the issues that mattered most to you. You could not have found a better partner than Gay. Her work in moving the justice agenda to a global level is inspiring and comforting. I remember her unprecedented work in pursuing the end of apartheid in South Africa, including receiving the election ballot from then citizen and soon after President Nelson Mandela, in the first democratic election held in that country. It is no wonder that she received the MacArthur "Genius" award for her humanitarian work, and that you both served as domestic and global ambassadors for justice and democracy. John, as I think about your incredible work, I'm reminded of a Scripture in the sixth chapter of Isaiah, the eighth verse, in the Holy Bible that says: "Then I heard the voice of the Lord saying, 'Whom shall I send? And who will go for us?' And I said, 'Here am I. Send me!' "
Those words remind me of you. Always responding to the call of duty. Taking on any task, no matter how difficult, thinking ahead and seeking to discover the next battleground and already having a plan of action in mind. For the last few months, I watched in awe as you followed the Fisher case through the circuit court, and the recent decision of the Supreme Court to hear the case. It was the penultimate challenge to your successful work in the Gratz and Grutter cases on affirmation action. You were preparing for that case with the meticulous detail that I have seen in everything you do. Coming almost 10 years after Gratz and Grutter, you were ready to continue to fight to preserve the right of institutions of higher education to keep their doors open to a diverse student body. I promise you that we will continue this struggle in your honor. You can say, as the apostle Paul said, after being jailed and constantly challenged as he kept his convictions, "I have fought the good fight. I have finished my course. I have kept the faith." You have, too, my brother, and we are grateful for it. Charles J. Ogletree Jr. is the Jesse Climenko Professor of Law at Harvard Law School and the executive director of the Charles Hamilton Houston Institute for Race and Justice.